My name is Gregor Murray, I am the man, in Man With A Van Glasgow and can be seen pictured to the right. About four years ago I purchased a van and did some removal jobs on a part time basis. It turned out I quite liked the nature of the work and I decided to go full time. What do I like about man with a van work? Well it's hard physical work, not everyone's cup of tea, but it keeps me fit and active and at the end of a day I feel that a rest has been earned and there is no need to go to the gym. I also feel that I am doing something worthwhile which is of a benefit to people. The service Man With A Van Glasgow offers saves people stress and money and people show great appreciation for this. Prior to working as a man with a van I studied Environmental Biology at the University of Paisley and gained a 2.1 honors degree. I followed this route of study because I am fascinated by the natural world. I love to learn about natural history and the science of wildlife. 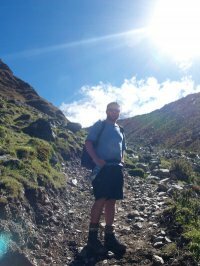 I am also an enthusiast for the outdoors and enjoy escaping to the countryside, camping, walking and cycling. Another passion of mine is traveling. I have spent two years of my life traveling and have visited South America, South East Asia and Australia and have visited such exotic places as the Andes and the Amazon. Above you see the man tereking in the Peruvian Andes.